When entertaining friends and family this summer, make drinks that little bit extra special by adding a bit of sparkle to them. 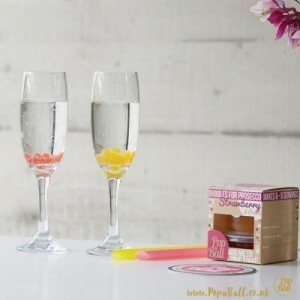 PopaBall have a wonderful range of products that will create drinks that shimmer and sparkle. The PopaBall shimmers make drinks look gorgeous and luxurious. I’ve tried the Rose Gold Shimmer with Prosecco when entertaining friends and it transformed the drinks beautifully. I got some many positive comments about how the simmer added sparkle to the Porsecco and everyone kept asking where they could buy it too. By simply adding a third of a teaspoon of shimmer powder to your glass, your Prosecco will never be the same again! The shimmer powders are available in many colours including rose gold, gold and silver so you can choose the perfect colour for your occasion. These shimmers can also be used in gin, vodka or any fizzy drink so you are not just limited to Prosecco. 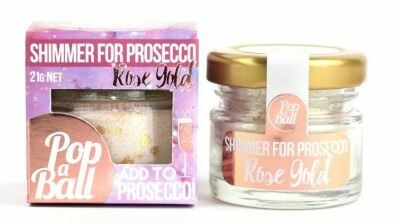 The RRP for the PopaBall Shimmer is £7.49. Another great product from PopaBall is the pot of Bubbles. You simply place the bubbles in your drink and watch how the fizz makes them dance around. Some of the bubbles will float to the top of your drink and some will sink to the bottom. The bubbles can be sucked up in the straw provided so you can experience every single bubble. When you can bite down on them you can feel them burst in your mouth with lovely juiciness. The bubbles are available in different flavours such as peach, strawberry and raspberry. The RRP is from £3.99. PopaBall have a fantastic selection of products that will make your drinks extra special. PopaBall also have gorgeous gift sets available that are ideal gifts. To see the full range visit popaball.co.uk.